Have fun transforming ordinary disks into contemporary, stunning jewelry. 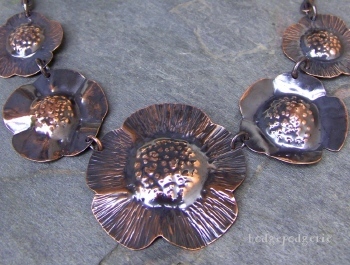 In this 6 hour workshop you'll saw, texture and learn very basic repoussé techniques to create concentric circle "sunflowers" out of copper discs. Learn how a tube rivet adds pizzazz to a clasp while adding strength to it. This is a cold metal techniques class, but torching is used to anneal the metal. Experience with jewelry hand tools is helpful. However, all skill levels are welcome. Annealing set-up including a powerful torch such as a Mapp Gas or acetylene torch, annealing pan w/pumice, water for quenching and a pickle pot and copper tongs for removing firescale. Beading awl for stretching smaller holes if necessary. "Wow! What a fun time...I can't believe I made this myself." 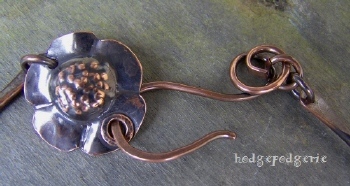 Return from "Sunflower Repoussé Workshop" page to "Wire & Metal Jewelry Classes" page.